ATR inhibition and caffeine augment UVB-induced apoptosis in primary human keratinocytes. Caffeine augments UVB-induced apoptosis in human keratinocytes (HKC). ATR siRNA mimics caffeine: inhibition of Chk1 phosphorylation and augmentation of apoptosis after UV treatment. Genetic and chemical inhibition of Chk1 augments UVB-induced apoptosis. ATR-induced apoptosis is largely p53 independent in HKC. New approaches to prevent and reverse UV damage are needed to combat rising sunlight-induced skin cancer rates. Mouse studies have shown that oral or topical caffeine promotes elimination of UV-damaged keratinocytes through apoptosis and markedly inhibits subsequent skin cancer development. This potentially important therapeutic effect has not been studied in human skin cells. Here, we use primary human keratinocytes to examine which of several caffeine effects mediates this process. In these cells, caffeine more than doubled apoptosis after 75 mJ cm-2 of ultraviolet light B (UVB). Selectively targeting two of caffeine’s known effects did not alter UVB-induced apoptosis: inhibition of ataxia-telangiectasia mutated and augmentation of cyclic AMP levels. In contrast, siRNA against ataxia-telangiectasia and Rad3-related (ATR) doubled apoptosis after UV through a p53-independent mechanism. Caffeine did not further augment apoptosis after UVB in cells in which ATR had been specifically depleted, suggesting that a key target of caffeine in this effect is ATR. Inhibition of a central ATR target, checkpoint kinase 1 (Chk1), through siRNA or a new and highly specific inhibitor (PF610666) also augmented UVB-induced apoptosis. 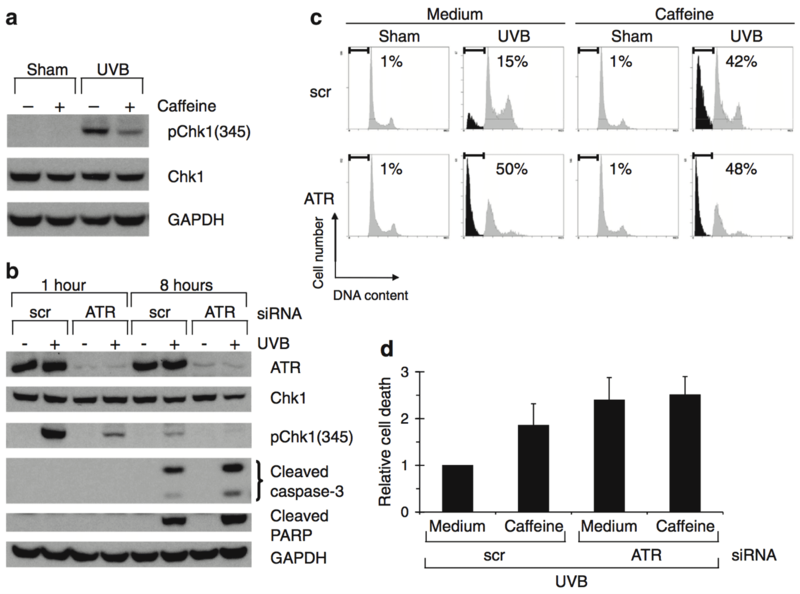 These data suggest that a relevant target of caffeine is the ATR-Chk1 pathway and that inhibiting ATR or Chk1 might have promise in preventing or reversing UV damage.